Are you searching for analog or digital chess clock? Tired of waiting while playing with your deep thinking brother? Now, you can have it for free. You can also train yourself according to certain timing. Previously I have posted on Chess Clock for Free basically for Windows. This want is great, but you will need to your laptop bring everywhere you want to play chess. These applications works with all cell phones with java. Just download the file to your PC, unzip and send to .jar file to your phone using bluetooth, infrared or USB cable. MobileChessClock is released in 2005 by Tomas Hubalek [Hubalek]. MobileChessClock can set different time for two different players. Only button number 6 is used to switch between players, but the sound when switching mimics real sound when pressing the real analog chess clock! I prefer MobileChessClock than ChessGoClock. Free! 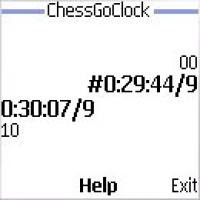 ChessGoClock is released by rainer_blind@gmx.de in February 2006. The difference with MobileChessClock is ChessGoClock has Fisher timer set up and it is easier to set up time. Time can only be set up once, same for both players, however, switching players in this application is much better, where one player use the left side button, while the other player use the right side button. But, no sound! Also free.